If you're an advanced skier looking for more challenge from your next ski trip, consider taking an extreme skiing tour. Extreme skiing is skiing that takes place on extreme slopes angling downward at angles greater than 45 degrees, without the aid of groomed runs or lights. You have to fight natural obstacles and ungroomed snow at high speeds as you make your way down the mountain. 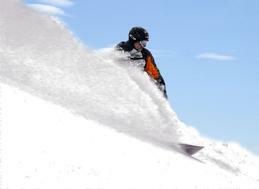 It's thought that extreme skiing began in the mid-1900s by skiers looking for an extra thrill. Swiss skier Sylvain Saudan was the first widely-proclaimed extreme skier, attempting slopes previously thought to be un-skiable. The sport became more popular in the 1980s when the sport officially became categorized under Big Mountain Skiing or Free Skiing, which means traveling down mountain on off-piste terrain. Clearly, skiing down steep slopes on ungroomed snow carries a lot of risk. When skiing off-piste, it's important that you carry GPS locator equipment that will send a notification to searchers if you get hurt. You should also wear an appropriate ski helmet and foam back protection to help prevent back injuries. If you want to experience extreme skiing, you first need to master your favorite ski resort. Get comfortable skiing the blue and black runs, and if the resort offers ungroomed routes, try those out, too. Skiing on ungroomed snow feels much different than skiing on the packed snow of a groomed route. Your skis will sink a little as you follow the terrain, and the natural changes in geography may mean that you have to change direction quickly to avoid trees, rocks or small cliffs. Before you hit the back country on your own, see if your favorite ski resorts offer instructional tours or guides that will help familiarize you with the extreme skiing experience. They may start you off on less-steep slopes in the back country, helping you find your footing and develop the mental acuity for responding quickly to unexpected barriers. With the increasing popularity of off-grid ski vacations, many ski companies offer trips to intermediate-to-advanced skiers. If you're enlisting yourself for a trip, don't oversell your skiing ability. Getting caught in a dangerous situation, hours away from help and medical care isn't something you want to experience. If you're not quite ready to try this form of Big Mountain skiing on your own, you can always watch videos of more skilled skiers and live vicariously through their adventures.